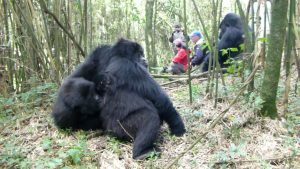 Come face to face with a massive mountain gorilla silverback in Congo, and be part of the family for an hour! You will be greeted upon arrival at Kigali Airport and driven to the Rwanda – DRC border at Grande Barriére (La Corniche). You’ll be assisted to clear Customs and cross the border, entering the Democratic Republic of Congo. Proceed on to the city of Goma or Virunga National Park for your overnight at the hotel or lodge. After a nourishing early breakfast, depart for Parc National des Virunga and head to the starting point of your gorilla tracking experience. After completing our park formalities, we embark on the unique mountain gorilla experience. These massive primates are extremely rare, with less than 700 alive at the time of writing. You will come within meters of the family, and you’ll enjoy spending an hour amongst them. Return to your hotel or lodge for lunch. In the afternoon, you will be transferred back to the border, and you will return to Rwanda’s Kigali Airport for departure.